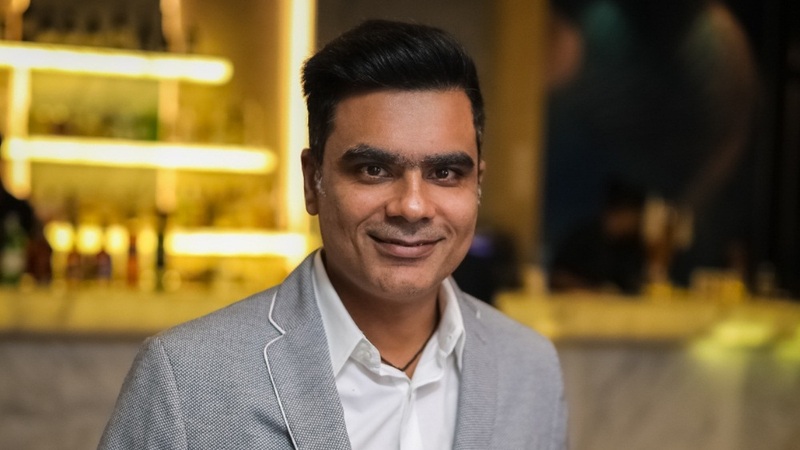 Vikrant Batra, a stalwart in the Indian food and beverage industry, is the mind and force behind the ingenious concepts of his stand-alone ventures, Cafe Delhi Heights and Nueva. He launched Café Delhi Heights in 2011; the restaurant celebrates the saddi Dilli spirit, truly. Another venture by Vikrant is Nueva - a casual-dining restaurant with a luxurious stand-alone bar. Being awarded numerous times by various food and beverage forums, Vikrant Batra aims to expand his restaurants globally. With the success of his restaurants, he has proven to be a man with great ambition and entrepreneurial skills. My parents started the Batra banquet in 1989. I started to work part-time while I was still in college. Seeing so much food around at the banquet, the foodie in me inculcated. I used to spend most of my time in the kitchen, with the chefs. I started taking the interest, then, on how the food was served and tried a lot of new cuisines. In 1993, while pursuing my Masters in Hotel Management, I started contributing more to the family business. It's quite easy to do the business when you are pursuing such a degree; it helps both ways. Later, I started taking full care of the banquet business. I started the outdoor catering all over India at weddings, receptions, birthdays and cocktails. That was quite an exposure for me. Also Read: What Makes Aerocity A Location Ingredient? I believe if you have done catering, you've done everything within the food industry. You learn a lot starting from taking care of logistics to taking food from one location to another and handling a lot of employees. The business was booming but I wanted to do something more organized because catering requires a lot of legwork and a lot of one-to-one interaction with the customers all the time. I took a break for a while, and in 2011, I opened my first restaurant Café Delhi Heights at Cross Point Mall in Gurugram. My brother looks after finances and projects, and I take care of the food and operations. Café Delhi Heights is a product of change, creativity, marketing, and, definitely, the content! I've been travelling a lot in the last couple of years. Whatever excited me or impressed me, I would take it back, and get it on my restaurant’s menu. I observed a continuous change and a lot of concepts evolving. By now, a lot of concepts have come to Delhi; the market is dominated by European and pan-Asian concepts. During my travel to South America, I saw close relativity between the Peruvian and Indian cuisines. I wanted to make something which is contemporary. We talk about modern or new things at restaurants. New has its own definition; ‘new’ is acceptable till the time it has an element of familiarity. I found familiarity in Peruvian cuisines. I instantly knew I wanted to bring modernism in the food. Therefore, I launched Nueva, meaning new in Spanish. The restaurant, basically, is about the influences – the modern and the Peruvian. This is what I wanted to get to the table for people. We don't plan businesses with what we think will work. It is about what customers will like. With people being very-well travelled now, they are getting experimental. Earlier, eating out was occasion-based activity. Now it's a need. People used to eat out only on birthdays. Now every day is an occasion. When I opened Café Delhi Heights it was a struggle for 24 months. It took time for people to adopt the concept. People accepted the concept of Nueva, too, and the response has been phenomenal. When Café Delhi Heights was launched the casual-dining restaurant format was not in the picture. Initially, creating awareness was and still a challenge. The word-of-mouth works best in the industry. When we started the restaurant, it was just the time when the ice-breaking social media was picking up. People were getting on social media, making food groups there was the continuous interaction about the new things happening in the town. That really helped. With Nueva, it’s different. Now the industry is evolving in days and hours. The acceptability, the knowledge and the means of awareness are accessible in everybody's hand, practically. No one as an entrepreneur wants to make a mistake. And the biggest risk in life is not taking it. So it is just about the best communication with your customers. The quality of food and the experience you give. If that is not your strength and you're not focusing on it then you already made a mistake of being in the restaurant industry. With the availability of the blessing of the population in the country, the restaurant industry as a whole has been able to give a lot of job opportunity and, thus, the revenue generation. And as far as service standards are concerned it's majorly about your own internal upgradations and the training you have been through. It's very difficult to compare an ‘A’ country's culture to a ‘B’ country's culture. Definitely, if you compare with a particular country where people are time bound by the clock, the standards are different and in restaurants in Western countries, the label is way expensive. For example, the customers, there, are supposed to pour water themselves while here in India, the consumers need to be pampered a bit, the waiting staff has to pour the water, place the napkins, and even refill the glasses all the time. I can't, really, compare the two concepts; it depends only on the culture. The success of any business depends on the supply chain. It is a much bigger concept than it may seem. It involves the process from procurement to availability, quality audit and reaching to the restaurant. The customers directly or indirectly become part of the supply chain as the end product reaches. It's the most critical thing to have a great supply chain. To give you an example, we'd made a central storage system. We have a base kitchen where we centrally procure everything, and dispatch in our vehicles, to maintain the quality. Secondly, the supply chain is very much under our control and the vendor gets the comfort of supplying everything in one place. See that's a very critical cost consciousness. - No discouragement but the restaurant industry, right now, has the biggest failure rate which everybody knows. - To start a venture, you have to be a pre-startup, do things on your own and gain experience as much as you could. - Your operating plans have to be very clear and focused. - You have to be passionate about your restaurant startup. - Don't make mistakes of overspending from day one. - Be clear about what you want to do. - And please don't lose focus on the main content of the food industry which itself says – food, food and food.